Welcome to the back of the bus. Congrats on having read everything worthwhile before this edition of Wine Press goes to the recycling pile; Or maybe it’s grave will be a physician’s waiting room where it will sit for a few years before composting, in situ. Wherever it goes, I do hope, assuming you have gotten this far into this column, you will remember one long word, Gewurztraminer. In some very unimportant ways, I am consistent. I like strong flavors; Jalapenos and Sriracha are what I call breakfast. Richly flavored spirits like single malt scotch and cask–strength Bourbon are my coffee and cream. I prefer a peppercorn to a jellybean, and a pickle to a Popsicle. And while I enjoy a richly flavored Barbera while knocking back a bigass maduro cigar, with wine I’m a wuss when it comes around having it with food. By no means am I admitting emasculation; I’m a manly sort of man… with a soft side. I just don’t like wines that draw blood when I’m eating. I like wines with food that hit the Goldilocks zone; complex flavors without overpowering alcohol, wood and viscosity. This is where Gewürztraminer really hits the center of the target for me because of its outstanding food applications. As you likely know, the first half of the word Gewürztraminer is Germanic for “spice” and hails from that region known for bouncing back between French and German rule over the last couple thousand years, currently French Alsace. It’s likely the reason Gewürztraminer was called spicy was because no one could define what they were smelling and tasting. I mean, what does turkey smell and taste like? It smells and tastes like turkey. There’s really no word to describe the perfumy, fruity character of Gewürztraminer, so some dude called it spicy and apparently the whole wine drinking world has been too confused on what they are smelling and tasting to call it anything else. 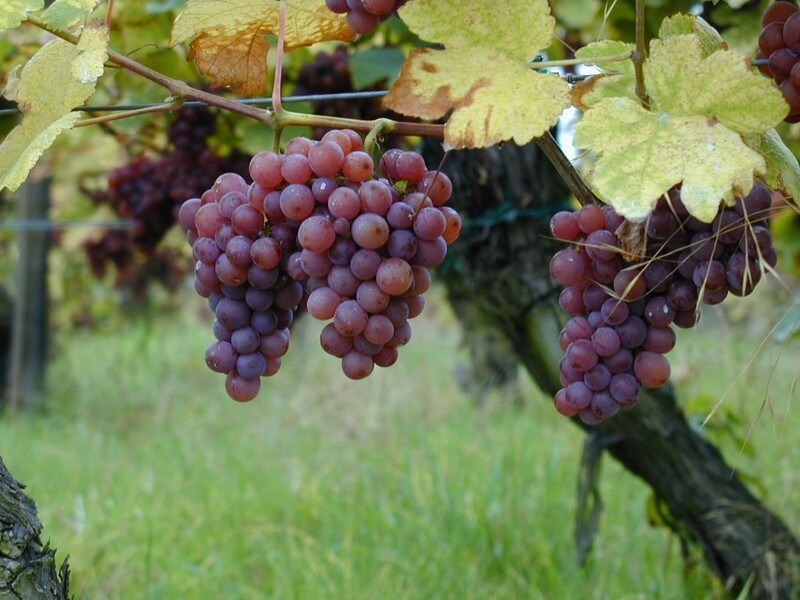 Although Gewürztraminer makes white wine, its grapes are reddish – mahogany when ripe. The pigmentation is kinda unstable, so only on rare occasion will you find a Gewürztraminer with a pink hue. Gewürztraminer ripens early in the grand scheme of things, so winemakers often seize the opportunity to pick at summer’s end to make it dry or fizzy, harvest a little later resulting in a fruity, off-dry version, or take it downtown to dessert. If you carefully assess your favorite Riesling, you will likely discover the spicy addition of Gewürztraminer is used to perk up the nose and mid-palate. Gewürztraminer is not an easy grape to make because the desired spicy character seems to yo-yo in and out of the flavor profile; one day you have it and the next day you don’t. It would be great if that just happened in the vineyard, but it also happens after Gewürztraminer is made into wine. Gewürztraminer can be the Houdini of wine; you taste a tank of Gewürztraminer a couple of months after fermentation and the spice is penetrating, go back a week later to find it vanished, then wait a month and it reappears. Fickle. Dry Gewürztraminer, commonly referred to as Alsatian style, is the type I most prefer. It is best made when the winemaker has harvested for acid and not because the sugar is optimal. Trying to keep a Gewürztraminer tart and capture the spice is a balancing act, because the spice is not sometimes evident in the vineyard at the preferred acid level; Gewürztraminer is tough to get it off with firm acidity after it gets around to turning spicy. For sure, Gewürztraminer is as tart as any grape prior to being fully ripe, but after veraison, when grapes soften and color sets in, the acid drops like a manhole cover and manhole covers don’t waste time falling. Texas pink grapefruit, gooseberry and lime are frequent descriptors that comprise the components of dry Gewürztraminer spice. While the cliché artists will insist its proper food marriage is with Asian cuisine, I would replace that broad-brush statement with duck, pork and Mediterranean chicken dishes as my dry Gewürztraminer menu. So now, here comes Mr. Consistency, the wine columnist that resembles the lone tree in the prairie swaying whichever way the wind blows, telling you that the type of Gewürztraminer I most prefer is when it is made off-dry. Off-dry Gewürztraminer typically possesses a myriad of fruit lying in the citrus blend, lychee and Fuji apple spectrum. Salivating. I’m in the boat with the majority on the Asian food thingy with off-dry Gewürztraminer, and add green salads with apple, or grapefruit, or pickled beets and feta or goat cheese. Imagine a creative salad as your light summer dinner and a cold bottle of off-dry Gewürztraminer; Lip-smacking! Yup, Gewürztraminer is hard to find. Only the committed make it; those wanting you to enjoy life like the dog and not the hydrant. I recommend you spice up your life with food-worthy Gewürztraminer, drinking it with friends in moderation, frequently.